There are people who dismiss the avocado as too fattening forgetting that is also packed with natural health goodness listed below. They contain potassium which is known to help control blood pressure. Avocados contain good soluble fiber which helps keep a steady blood sugar and also fats which can actually reverse insulin resistance that helps to regulate blood sugar levels. Due to the high healthy calorie content in avocados (For every 100 grams, an avocado contains about 200 calories) it makes for the best ingredient for those trying to put on weight. Avocados contain a compound called beta-sitosterol which helps to lower blood cholesterol levels LDL which is bad cholesterol and increase HDL which is good cholesterol. Avocados contain Phytonutrients such as polyphenols and flavonoids which have anti-inflammatory properties. These reduce the risk of inflammatory and degenerative disorders. Avocados contain folic acid which plays a huge role in the prevention of birth defects, such as neural tube defect and spina bifida. 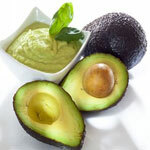 Due to the glutathione content in avocados, a diet with an inclusion of avocados can free your body of free radicals. Avocados are rich in antioxidants which help slow aging symptoms. It also contains minerals which may boost the immune system, encourage a healthy nervous system. If you eat a diet rich in folate, you may be able to evade getting a stroke. Avocados contain vitamin E, glutathione, and monounsaturated fat, which help in the maintenance of a healthy heart. They also contain vitamin B6 and folic acid, which help regulate homocysteine levels which are known to increase the risk of heart disease. Studies have shown that the avocado with its oleic acid is effective in preventing breast cancer. And can also inhibit the growth of prostate cancer. They are a natural mouth wash as they cleanse the intestine which is actually the real cause of bad breath and coated tongue. When you eat avocados on the regular your body will be able to absorb 5 times the amount of carotenoids. 2013 Copyright Capital FM. Distributed by AllAfrica Global Media (allAfrica.com).